You can have all the equipment , big lenses , top end camera and camouflaged better than a bush , then sit for hours in the cold and wet ,but without a bit of luck you probably won’t push the shutter button. 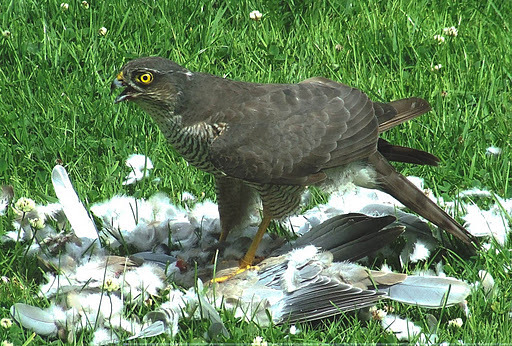 On the other hand you could sit in your warm sunny conservatory having a cup of coffee and a Goshawk drops down in front of you with a pigeon and proceeds to eat it 3 meters in front of you ! – reach for your compact camera lean forward and take a few shots. The bad news is – it didn’t happen to me! My Nephew , Joe took the picture. i can’t talk about it anymore!! !